FBI photo provided by Webb Canepa / After the casino corridor was evacuated, technicians detonated a bomb left in Harveys along with an extortion note. If it was moved, bumped or jostled, 850 pounds of dynamite would have exploded inside a homemade bomb disguised as a large copy machine, injuring or killing an estimated 600 people inside Harvey’s Resort Hotel 25 years ago. In the early morning hours of Tuesday, Aug. 26, 1980, the bomb with at least eight trigger mechanisms was rolled into the lobby of what was then called Harvey’s Resort Hotel by John Birges Sr., a disgruntled Hungarian gambler. A extortion note demanding $3 million was also left behind. Many authorities later considered the subsequent explosion causing millions of dollars in damage to the Stateline casino owned by Harvey Gross the largest domestic terrorist act until the February 1993 bombing of the World Trade Center. Unlike that explosion, where six people were killed and more than 1,000 injured, no one died in the Harvey’s bombing. The successful evacuation, the time authorities had to examine the device, the motive of the bomb builder and other bizarre details contribute in separating the Harvey’s bombing from similar events. Since the bombing, the casino was renamed Harveys Resort Casino. Although there are various descriptions of the bomb, it is probably safe to go with the details given by retired FBI Special Agent Bill Jonkey. Assigned to the Carson City office, Jonkey, a bomb specialist, was the agent in charge of the criminal portion of the case. It was comprised of two steel boxes, one stacked on top of the other. The bottom box contained the bulk of the explosives. The smaller box on top held eight switches, or triggers, to ignite the device, Jonkey said. “You have to show in court it was a bomb,” Jonkey said. “The bomb technician testified the ways to trigger the bomb and we took a recess and before I left the bench I heard Birges tell the bomb expert something to the effect, ‘You don’t know what you’re talking about. There’s a lot more ways the bomb could have been triggered,'” McMorris said. The bomb was wheeled in under the guise of a crude copy machine. Birges’ girlfriend, Ella Joan Williams, stitched an IBM insignia on the silk cover. Glue and toothpicks jammed the door leading into the lobby area where the bomb sat, Jonkey said. A three-page, single-spaced extortion letter in a business-sized envelope with the words “To the management” in capital letters sat on the floor next to the cloaked bomb. The “deactivating-the-bomb plan” was to blow the box with all the triggers off the lower box containing the majority of the dynamite. Ron Pierini, sheriff of Douglas County Sheriff’s Department, was a captain at the Lake Tahoe substation who helped direct the evacuation and traffic rerouting during those days in late August 1980. Before the evacuation order Aug. 27, gamblers stayed at gaming tables and slots the night before. Thousands of people were moved out of the corridor with many diverted to Whittell High School in Zephyr Cove. According to Tribune archives, people were ordered out of Harrah’s first, followed by guests and employees at Caesars and the portion of the Sahara (now the Horizon) facing Harveys. 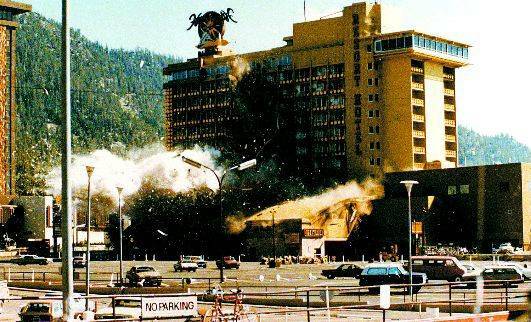 Kanoff, chief of Lake-Tahoe Fire Protection District, said walls were removed to help direct the blast toward the buffer zone between the doomed casino and the Sahara. The blast punched a 30-to 40-foot hole from the Sage Room toward the Sahara. Windows shattered. A steel door received a dent the size of a softball. Plywood belted surrounded buildings. Debris flew over the Sahara. “That’s how powerful that bomb was,” Pierini said. Jan Haag, a young Tahoe Daily Tribune reporter, surveyed the chalky-white debris of twisted rebar and concrete. “I remembered walking the rubble and thinking ‘This is what war must look like.’ I knew right then and there I would never be a war correspondent,” she said. A list of potential suspects had 502 names of people living across the county. A reward of $200,000 was issued for information leading to the arrest and conviction of the criminals. Then authorities increased the pot, upping the ante to $500,000 in reward money. Ella Joan Williams, girlfriend of the elder Birges, was in a minor vehicle accident in Tahoe – possibly near a location where extortion money was to be dropped off – at the time of the bombing and was hospitalized for a short period. Williams was accused of writing the $3 million ransom note. A helicopter delivering the money couldn’t find the extortionists, which Kanoff attributed to a location error in the ransom note but others attributed to a battery malfunction in a strobe light that was to be used to signal the helicopter. Another piece of evidence came from a clerk at a motel near the “Y” remembered seeing people in white jumpsuits working on a white van in the morning the bomb was delivered. The FBI had a tip from initial bomb reports that the device was delivered in a white van by people in white jumpsuits. At one time, John Jr. confirmed he was in Lake Tahoe but denied a role in the bombing. Instead he told investigators he was scouting Tahoe for possible places to grow marijuana, Jonkey said. Because of Tahoe’s inclement winter weather that makes growing mostly anything outside unrealistic, authorities knew he was lying. “So it all fit together,” Jonkey said. John Jr. was subpoenaed to testify to a grand jury in Reno. Afterward he was charged with perjury. In his early 20s at the time, John Jr. agreed to cooperate with authorities. Birges Sr., 59 years old when arrested, was, by descriptions, an avid gambler who lost $1 million to the Stateline casinos. Wanting revenge and his money back an then some, he stole nearly about 850 to 1,000 pounds of dynamite at a hydroelectric construction project near Fresno in June 1980. Jonkey refused to label Birges Sr. an explosives mastermind. Instead, the landscaper used his knowledge in automatic sprinkler systems to construct the bomb. An explosive device that authorities said would still stymie them today took Birges Sr. three weeks to construct in his garage. Williams was also arrested along with Willis Brown and Terry Hall, two laborers who was hired by Birges Sr. to help move the bomb when the two younger Birges refused to participate in placing the bomb in Harveys. Gross died in 1983. Birges Sr. died from liver cancer in 1996 while incarcerated but his plot to recapture money had a lasting impression on casino security and Nevada history.